There is a mark but it's not very good. It's all hand painted. 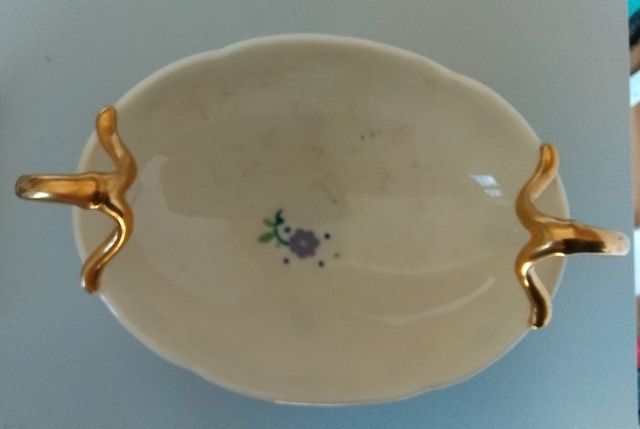 I think it’s Lenox Belleek - Made in the US, rather than the Irish original. Google is being most unhelpful with any further info though. Do you think it might be 1950s-ish? Your mark is upside down, an L, and I think it's a mark used on blanks sold to hobbyists and professional decorators. You can't really date it, since it could have been painted at any time after the blank was made. 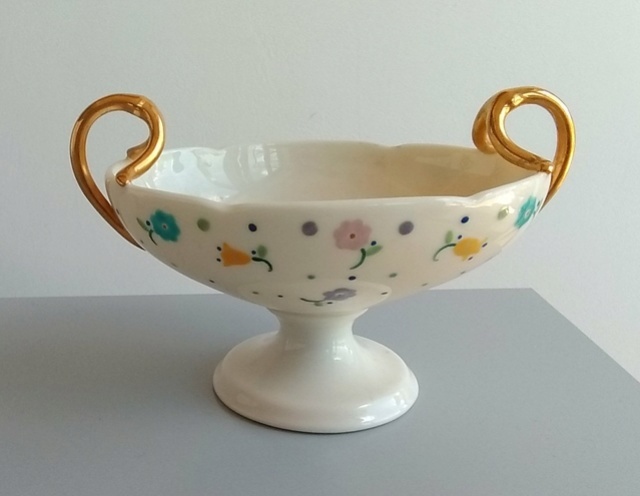 I’ve checked and it’s definitely Lenox Belleek, but you’ll have to trawl through the listings to find the date. 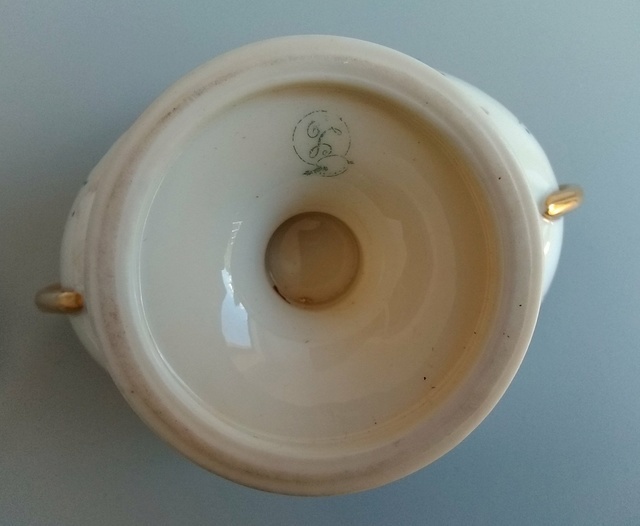 The mark was used from about 1906-26, according to Lehner's, but, again, hobbyist painted at any time, so the maker of the blank is not important. It would be very unusual for a hobby painted US blank to turn up in the UK. The style is reminiscent of Shelley designs from the 20s. I've given it a good scrubbing now - the flowers appear to be painted under a clear glaze, so I wouldn't have thought it to be a hobby blank. The mark doesn't appear to have ever had BELLEEK printed on it. Don't know if that is indicative of anything? It does seem well painted, with Lenox’s characteristic gilded handles, and hobbyists usually sign their work. It’s a narrow space. 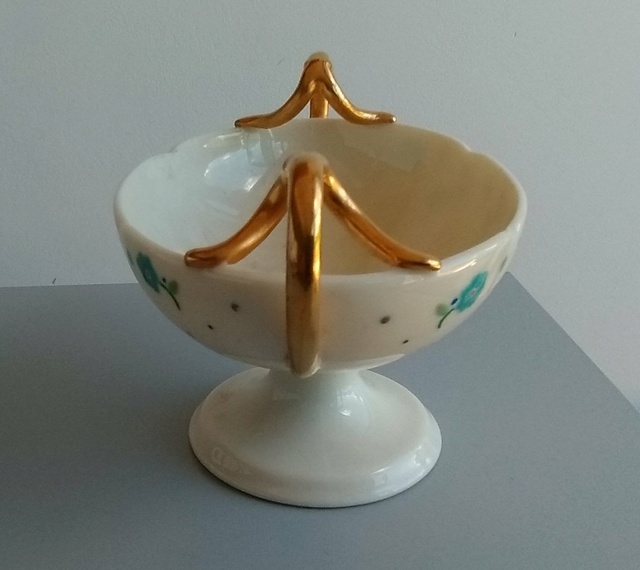 There may not have been room for ‘Belleek’ too on that particular piece. Thanks everyone - you're all wonderfully helpful as always.